GAMBLING in Maryland Part 3: This is the third part of a four-day series by Capital News Service examining how Maryland uses gambling to raise revenues. Eastwood stood in the stands near the finish line, leaning against a railing that was flaking green paint. He had come to Maryland from Connecticut to visit his son and decided to check out the track. He said he used to work in horse racing, traveling and taking care of horses at various tracks up and down the East Coast. He wishes he could get back into the work. But nationwide, the industry is in bad shape. In December, California’s Betfair Hollywood Park closed after 75 years. In June, Beulah Park in Ohio, the state’s first thoroughbred track, closed. Pimlico saw 31 days of live racing in 2008. In 2012, Pimlico had 29 live race days. Pimlico however, is open year round for simulcast racing. In 2008, total Pimlico attendance was 455,069. In 2012, Pimlico attendance had dropped about a third to 300,056, according to the Maryland Racing Commission’s annual reports. On April 25, a Friday, 1,350 people came to the track. People in the business understand Eastwood’s assessment. “For us who have been in the horse industry for a long time, sometimes it’s jarring to go out there and see not very many people,” said Cricket Goodall, the executive director of the Maryland Horse Breeders Association and the executive director of the annual Maryland Million event. “We have had lots of discussions over the years with the track on how to do a better job,” Goodall said, noting the need for repairs. “People talk to us about it, talk to the racing commission, they talk to the press, they talk to a lot of people. But the track has determined that they don’t make enough money throughout the year to be able to do the upgrades,” Goodall said. 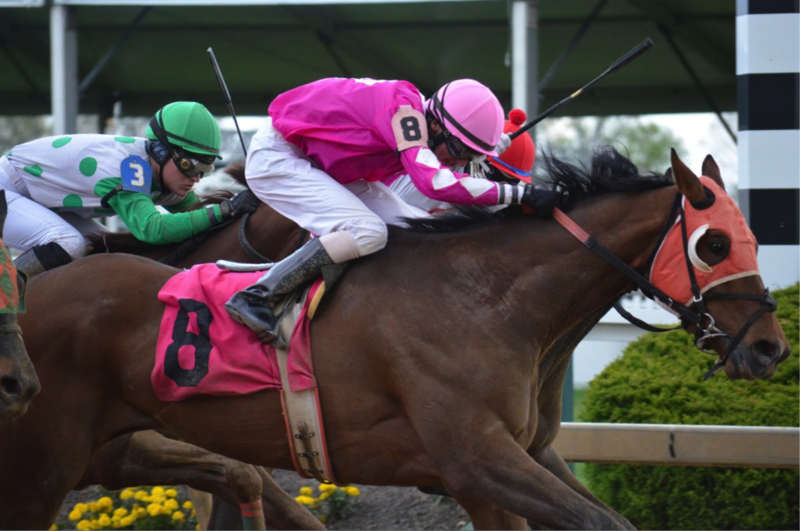 Goodall’s organization works with her constituents to produce the best Maryland-bred horses they can and then race them at the track. The better the horses and the greater the number of horses, the more money people tend to wager and, subsequently, the more money returns to the industry, Goodall said. The association also administers the Maryland-Bred Race Fund for the Maryland Racing Commission. Goodall said the purpose of the fund is to support Maryland thoroughbred breeding and racing. Higher payouts for horses bred and raced in state are designed to encourage business. Since the opening of Maryland’s first casino in 2010, a portion of the money generated by slots has gone to the state’s horse racing industry and the thoroughbred incentive fund. For fiscal year 2013, more than $25 million was generated for thoroughbred purses alone, while more than $3 million went toward the thoroughbred incentive fund, said Mike Hopkins, the executive director of the Maryland Racing Commission. Goodall said that the program is benefiting from the added slots money, but progress has been slow. “We are seeing the results from the additional funds, but it’s going to take probably at least four years to really see the impact” — enough time to breed the racehorses, Goodall said. The industry, she said, understands that the money dedicated to improving Maryland racing is coming from casinos — which are competing with the tracks for gamblers’ dollars. The tracks are facing competition that they simply didn’t have a generation ago. “Gambling on slot machines is a whole lot easier than gambling on horses,” Goodall said. “To succeed in horse racing, one must pay attention, she said. “Certainly you could just gamble by picking your favorite color or your favorite number, but if you really want to try and make money, you have to think about it. Some other states have slots at tracks –something racing industry supporters pushed for in Maryland but failed to win. Doing so makes the track more of a destination, she said. But, she added, Maryland slots went to casinos, not tracks, and now the industry must figure out other ways to survive. While Goodall believes that larger, better-quality races will go a long way toward helping attendance at Pimlico and other Maryland tracks, she isn’t certain that racing will be what it once was. Maryland racing’s biggest day of the year is the Preakness, the second leg of horse-racing’s Triple Crown. The 2014 Preakness gambling handle — the total of bets on the day’s events — was nearly $84 million, racing officials said, with a record crowd of more than 123,000 people at the track May 17. Michael Jeffra, a valet parking attendant at Pimlico, calls the Preakness “a happening. It’s an event. It’s not just a gambling venue. “There’s people in there, kids don’t even know there’s gambling going on, right? We’re liable to see anybody, Tiger Woods and his girlfriend here, you know? Anybody,” said Jeffra. The rest of the year at Pimlico, though, is not a happening. Pimlico hosted only 35 live race days in 2014, from April 3 to June 7. A typical race day at Pimlico sees nine races run throughout the afternoon. All told, the state plans to host 156 live days of thoroughbred racing this year at Pimlico, Laurel and Timonium. This is a vastly shorter season than, say, 30 years ago. In 1984 there were 235 days of live thoroughbred racing at those same tracks and Bowie Race Track, which closed in 1985, held an additional 79 days of racing, Hopkins said. But even without live racing, Pimlico is open all but two days this year. On the days when horses aren’t running, fans come to watch simulcasts of races at other tracks. Tony Furnari, 84, was at the track on a Friday this spring. He was there on his birthday to watch the races — both live and on the many television screens scattered about the betting-room floor. Furnari, who lives in Baltimore County, sat on a bench with his back to the track, not distracted by the horses that were moving into position for the next race. Instead, he was looking up at television screens, watching other horses running at other tracks. The room smelled stale and seemed unnecessarily large for the few people, mostly men, who were clustered around the screens, clutching their tickets and schedules, mesmerized. People were beginning to trickle outside for the next race. Some sat in rusty, green folding chairs, while others stood by the door and lit cigarettes, cheerfully ignoring the “No Smoking” signs posted every 5 feet. This scene at Pimlico is far different than the one Furnari first came to 68 years ago.